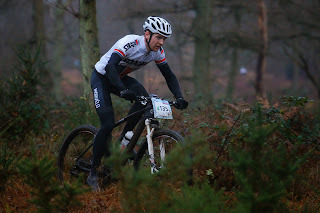 Round 2 of one of my favourite race series, after a fun xc race the weekend before at the Off Camber series, where I came a strong 3rd behind national level expert and master xc racers, I felt to have some form and speed. With the usual fast faces on the start line it was never going to be easy! Ceasers camp is renowned for being a hilly course, but that usually suits me. I got a good start, but I knew better than to try and keep up with the front 5! I settled into a group with James Braid from Wiggle and a few others, I held the pace up the hills and sat back during the single track, trying not to make any silly mistakes! this went on for the first 2 laps. Eventually we split up, the pace was too high for me to sustain, so I hoped to catch them later on. The rain began after an hour or so, light to start but it got heavier so I changed into my Castelli Gabba jersey, such a brilliant piece of kit, it kept me warm and dry without me overheating! The course was great fun once it got muddy, slippery in places but there was still lots of grip, my lap times dropped slightly, but I stayed 8th, feeling strong. I started my last lap 10minutes before the cut off, the course was much quieter by now, but in the last few miles I caught 7th place, I knew I had to put a gap between us so I upped my pace, then in the last hundred metres I spotted 6th place, I tried to sprint for the line, but I had left it too late! happy with 7th, glad to be in the top 10, few niggles to resolve but happy with my form. 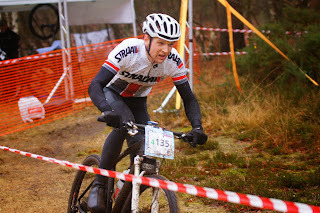 We have a short break of two weeks until the next round, where I hope to be riding my new team bike! !